I make my own custom herbal blends for rabbits, check out my Bunny Blends! The contents herein, such as text, graphics, images, and other material contained on this site ("Content") are for informational purposes only. The Content is not intended to be a substitute for professional veterinarian advice, diagnosis, or treatment. Always seek the advice of your veterinarian with any questions you may have regarding the medical condition of your pet. Never disregard professional advice or delay in seeking it because of something you have read on this website. If you think your animal has a medical emergency, call or visit your veterinarian or your local veterinary emergency hospital immediately. Edelweiss Ranch & Rabbitry does not recommend or endorse any specific tests, veterinarians, products, procedures, opinions, or other information that may be mentioned on this website. Reliance on any information appearing on this website is entirely at your own risk. Let's face it, no matter how responsible a breeder you are, occasionally rabbits get sick or just fail to thrive. Rabbits don't always respond well to Western medical treatments and chemicals, but they often respond well to natural remedies. It's easy to administer herbs. You can opt to use either dried, fresh, or both. Put dried or loose herbs in a little dish and let your rabbit pick through them. I don't recommend adding them to your feed, as your rabbit may dig through their feeding looking for the herbs. You can also brew them into a tea and add to their water bottles or bowls (fair warning, some herbs do stain your bottles), or syringe directly into their mouth. I have found that usually offering them to your rabbit first as a loose herb or fresh plant works best. I recommend offering a few different herbs that work on the same things (ie both caraway seed and lemon balm for bloat) so that your rabbit can pick and choose what he or she needs. Rabbits eat instinctively, so they are very good at knowing what they need. My favorite rabbit herb is plantain which grows wild here in the pacific northwest. You probably have some growing in your yard! It comes in both a broad and a narrow leaf and the rabbit can eat the entire plant. Dandelion is another great herb, and the rabbit can eat the entire plant. Fresh parsley especially is a great bloat treatment, if you can get it to your rabbit while the symptoms are early while the rabbit is still willing to eat. Weaning kits are especially prone to stress-induced illness such as bloat and stasis. Supplementing their feed with herbs can be a good way of staving off these issues. Calendula/Marigold: AVOID DURING PREGNANCY. Slowly healing wounds, ulcers, skin diseases, digestive problems, digestion, anti-inflammatory, antispasmodic, antiseptic, antimicrobial. Caraway Seed: AVOID DURING PREGNANCY. Bloat, gas, appetite stimulant, expectorant, antibacterial, constipation, increases milk flow, anti-fungal. Chamomile: Pain relief, nervousness, eye wash (weepy eye), microbial, fungal, antibiotic. Chickweed: Anti-inflammatory, molt, wound healing, eye wash, expectorant. Cleavers: Wound healing, laxative, urinary infections. Comfrey: Good for being off feed, digestive aid, healing, wool block, immune booster, good for pregnant and nursing does. Too much can cause diarrhea. Dandelion (Leaf, Flower, Root): Blood purifier, respiratory issues, anti-inflammatory, bladder infections, regulates both diarrhea and constipation, milk production. Echinacea: Immune booster, antibiotic, anti-inflammatory, anti-viral, anti-septic, antimicrobial. Elderflower: Expectorant, fever reducer, antibacterial, antiviral, immune boost, stops bleeding. Fennel: Bloating, gas, increases milk production. Fenugreek: AVOID DURING PREGNANCY. Increases milk production, builds appetite, stimulates labor, encourages weight gain. Goldenseal: Antibiotic, immune booster, anti-inflammatory, astringent, respiratory issues, digestion, eye wash (weepy eye), builds appetite. Grapefruit Seed Extract (GSE): Antibiotic, anti-parasitical, anti-microbial, anti-viral, bactericide, fungicide, water purifier. Lavender: AVOID DURING PREGNANCY. USE SPARINGLY (tranquilizer). Gas, stress, circulation, induces labor, exhaustion, pain reliving, anti-convulsive, appetite stimulant, antimicrobial, anti-rheumatic, antiseptic, antispasmodic, anti-toxic, gas-relieving. Lemon Balm: Prevents miscarriage, bloating, gas, anti-bacterial, antiviral, diarrhea, stress, increases milk production. Licorice Root: Gastric inflammation, coughs, immune booster. Linden Flower: Gas, digestion, inflammation, scanty and/or dark urine, anti-seizure. Marigold/Calendula: Slowly healing wounds, ulcers, skin diseases, digestive problems, digestion. Marshmallow Root: Increases milk production, digestion. Meadowsweet: Eye wash (weepy eye). Milk Thistle: Increases milk production. Nettle Leaf: Milk production, digestion, appetite, urinary tract, rheumatism and arthritis, condition, immune booster. Olive Leaf: Antibacterial, antimicrobial, antiviral, antioxidant, immune booster, diarrhea, infection, digestion. Parsley: AVOID DURING PREGNANCY. Good for bloat, especially fresh. Increases milk production, increasing litter size (both bucks and does- feed 10 days prior to and during mating). Peppermint: AVOID DURING NURSING. DO NOT FEED TO YOUNG KITS. Digestion, gas, bloating, decreases milk production, mastitis. 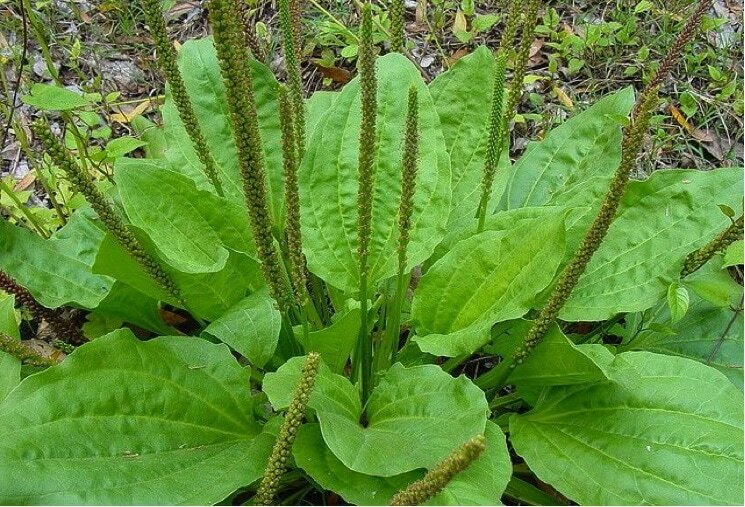 Plantain: Digestion regulator, URI, antimicrobial, antispasmodic, expectorant/phlegm reducer, diarrhea, gas, helps with weaning, wound healing, expectorant, fever reducer, diarrhea, urinary tract infections, gastric inflammation. Raspberry Leaf: Promotes milk, good for labor, diarrhea, digestive upsets, infertility, fever reducer, pregnancy condition. Feed during last two weeks of pregnancy as preventive prenatal supplement. Red Clover: Eye wash (weepy eye), boosts fertility, respiratory. Rose Hips: Immune booster, antioxidant, arthritis. Rosemary Leaf: Exhaustion, weakness, circulation, digestion, depression. Sage: AVOID DURING PREGNANCY. AVOID DURING NURSING. DO NOT FEED TO YOUNG KITS. USE WITH CAUTION. Decreases milk production, digestive stimulant, uterine stimulant. Slippery Elm: GI problems. Feed shredded or grind and add to water. Thyme Leaf: Diarrhea, digestive upsets, expels worms, chest infections. Willow (Twigs and Leaves): Intestinal inflammation, pain reliever. Yarrow: Helps blood to clot, improve circulation, antispasmodic, diarrhea, gas, antimicrobial, anti-staphylococcal, antibacterial. Herbs in red should be used with caution- see the herb in the list above for details. Appetite Builder/Weight Gain: Caraway Seed, Comfrey, Fenugreek, Goldenseal, Nettle Leaf. Bloat: Caraway Seed, Chamomile, Dandelion, Fennel, Linden Flower, Parsley, Plantain, Rosemary, Thyme, Willow Bark. Diarrhea: Cleavers, Plantain, Raspberry Leaves. Remove all pellets and hay, provide leaves and/or brew tea to add to water. Good mix for rabbits with soft or mushy stool, ESPECIALLY young kits. Digestive Issues: Chamomile, Comfrey, Dandelion, Fennel, Lavender, Lemon Balm, Linden Flower, Marshmallow Root, Nettle, Oats, Olive Leaf, Plantain, Raspberry Leaf, Rosemary, Slippery Elm, Thyme. Drying Up Milk: Chickweed, Lemon Balm, Parsley, Peppermint, Thyme, Yarrow. Eye Infection: Chamomile, Chickweed, Meadowsweet. Immunity Boost: Calendula, Comfrey, Echinacea, Elderflower, Lemon Balm, Licorice Root, Nettle, Olive Leaf, Plantain, Rose Hips. Milk Production: Caraway Seed, Chamomile, Dandelion, Dill, Fennel, Fenugreek, Marshmallow Root, Nettle, Raspberry Leaf. Pain Relief: Chamomile, Willow Bark. Stress: Chamomile, Comfrey, Lavender, Lemon Balm, Linden, Slippery Elm. Wound Healing: Calendula, Chamomile, Chickweed, Cleavers, Comfrey, Elderflower, Licorice Root, Willow Bark.